An equal proportion of pork and beef was used, then passed through a through a 3.2mm mesh to grind and freeze. 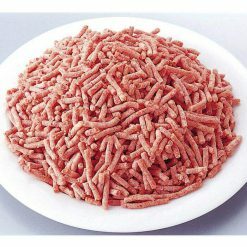 The ground meat is a homogeneous combination of delicious and juicy meat. Product contains 200g (100g × 2 bags). Made with Sugarlady beef and Sugarlady pork in equal proportions. In an effort to deliver delicious and safe meat to customers, Sugarlady developed their original meat. Sugarlady beef comes from Kuroge cattle in Australia that are strictly monitored to keep your beef both safe and tasteful. Made with Sugarlady pork, which comes from pigs in Aomori and Ehime, Japan, that Sugarlady raises for three generations before use. Sugarlady ensures the pigs live in a clean environment, resulting in thin muscle fibers and juicy meat. If cooking with stir-fry, it is possible to take the ground meat as is and take appropriate portions from the packaging, while still frozen. Please thaw completely in the refrigerator (about 8 hours). 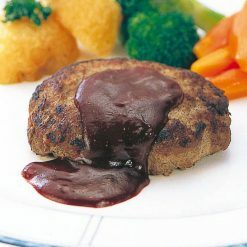 If you are in a hurry, take the ground meat out of the bag and thaw under running water (about 15 minutes with the water temperature at 15 ℃). Ideal ingredient for hamburgers, meat sauce, meaty dumplings and the likes. Browning ground beef is an easy process. Place the ground meat in a skillet with a little bit of oil, and cook over medium-high heat. The most important part to browning ground beef is using a wooden spoon or heatproof spatula to break up the ground beef into equal-size pieces as it cooks. The meat will cook better in the center of the pan. This product contains beef (Australian), pork (domestic). This product is not suitable for anyone with allergies to beef or pork. Domestic product: beef (Australia) and pork (domestic). Prepared and packaged in Japan.